(VEN) - Ahead of the 2018 Hue Festival, the Hue Monument Conservation Center has launched a virtual reality tour for visitors to the imperial city, designed to bring alive the historic relic to promote tourism and heritage preservation. Hue imperial city is the first heritage site in Vietnam and one of three sites in the world to deploy the advanced technology to serve visitors, together with two other sites in China and the RoK. The tour was developed under a cooperation program between the Hue Monument Conservation Center and its Republic of Korea (RoK)’s partner, IV COM Co., Ltd, at an investment of VND48.119 billion. The virtual tour takes visitors into a multidimensional space where the past and present meet, travelling back to 200 years ago to explore the elaborate design and grandiose exteriors of Khai Dinh tomb, the resting place of Khai Dinh Emperor (1885-1925), recreated in glorious colors. It includes a simulator that enables visitors to see every corner of the imperial city from above; a beacon that will help see the architectural constructions of the past; and VR technology allowing visitors to “travel” around the imperial city. The imperial city is a walled palace within the citadel of the city of Hue, which was the seat of Nguyen Dynasty emperors from 1802 to 1945. Its hundreds of palaces and buildings suffered extensive damage in the 1960s and 70s during the American war, and some have undergone restoration in recent decades. The United Nations Educational, Scientific and Cultural Organization (UNESCO) has proclaimed it as a World Heritage Site. Mai Hoa, a visitor from Hanoi, said it was wonderful to discover Hue’s heritage sites with the virtual reality technology. The tour enables visitors to learn more about the ancient capital’s cultural and historical sites, and makes them respect the remaining vestiges. 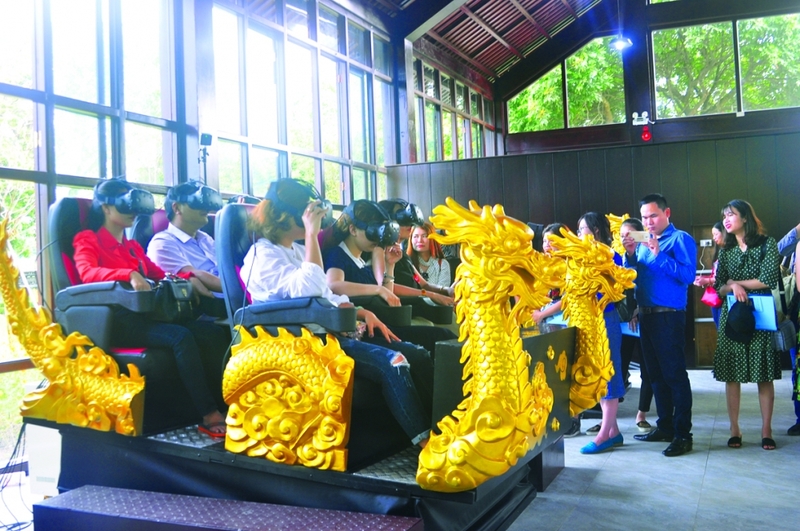 Phan Thanh Hai, Director of the Hue Monument Conservation Center, said, the virtual reality technology will be continuously updated to better satisfy visitors and provide visitors with more interesting experiences.